The Julio Iglesias concert 2010 Malaga is the only show performed in Spain in his 5 Continents tour titled Starry Night at the Malaga Bullring on July 28 at 10:00pm. Julio Iglesias is the highest selling Spanish singer of all time selling 300 million albums in 14 different languages. He has released 77 albums and has been awarded over 2,600 Platinum and Gold records over the course of his 42-year career. 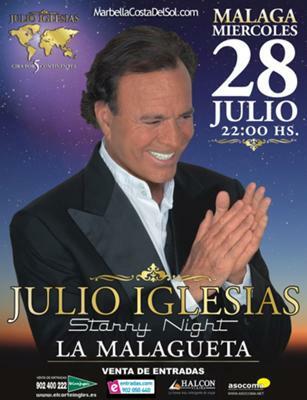 The Starry Night performance will include popular songs that Julio Iglesias has dedicated to his fans around the globe. He is a truly engaging performer that captivates the audience with his charm.